Our first Cohort of innovators will be graduating from Cyclotron Road over the next few months, bringing the pilot phase of our experiment to a close. As we approach this milestone, our team has been reflecting on what we’ve accomplished, working to understand what we’ve learned, and sharpening our focus for the next chapter. These discussions have converged on a renewed clarity of mission for our team: empowering science innovators to go from concept to first product and positioning them for broad societal impact. Our vision is for Cyclotron Road to be the example of excellence for early-stage science innovation and a magnet for the scientists and engineers who are most driven to advance transformative technologies. Looking forward, we’ll be focused on making Cyclotron Road the best possible home for these people. With that in mind, read on below for three reasons that we're fired up headed into 2017. We hope that this vision excites you as much as it does us, and that you’ll stay engaged with our effort in the coming months and years. And if what you read below is something you’d like to help us build, please contact us to explore how you can best get involved. Lastly, our team is continually thankful for the opportunity to pursue this vision based on foundational support from Berkeley Lab and the DOE EERE Advanced Manufacturing Office. We're excited to keep working with our partners at DOE in the next phase of this effort. Reason 1: Science innovation and hard tech are more important than ever. We firmly believe that new technologies rooted in the physical and biological sciences will be fundamental to addressing the 21st century’s biggest challenges in energy, water, food, and health. We’re excited to be testing a new model to move these technologies from idea to impact and we hope that our efforts will inspire many more experiments to facilitate that process. Reason 2: Cyclotron Road is working. Recruit best-in-class scientists and engineers, empower them to go from concept to viable first product, and position them on a path to market. In its purest form, this is the strategy we set out to test in our pilot program. We recruited eight innovators across six teams and gave them a small amount of funding, access to Berkeley Lab’s world-class tools and expertise, and mentorship from our program team and network for two years. Cohort 1 has made astonishing progress in this environment. They’ve made scientific discoveries, scaled materials from flasks to giant reactors, broken world records, found markets, and signed customers. Most importantly, we’ve built them a bridge to public and private funding that will support their efforts beyond our program. One hundred percent of Cohort 1 teams have built a first prototype or secured the financing to do so during the program. The obvious question is: “to what end?” This is the long-term experiment that’s at the heart of Cyclotron Road. Time will tell whether transformative support at this early stage leads to bigger impact in the long run. Our ultimate success will be measured on the scale of gigawatts, tons of CO2, billions of dollars, and millions of lives. In the near-term, we’re encouraged to see that the private sector is getting engaged. We recently announced the formation of our Leadership Council, a group of 22 luminaries from across the innovation ecosystem, including some of the world’s biggest companies. Their involvement is an important indicator that we’re putting our teams on a viable path and their guidance will keep us honest as we march forward. Reason 3: There’s a huge opportunity in front of us. 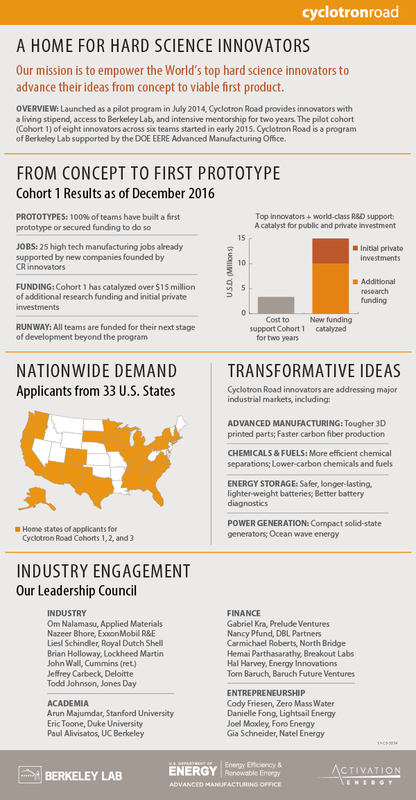 We’re currently in the process of reviewing applications for Cyclotron Road Cohort 3. For the third year in a row, over 100 aspiring energy innovators from across the country threw their hats in the ring. One thing is certain: there is no shortage of talented scientists and engineers looking to devote their lives to making an impact with technology. Knowing this, we see our biggest opportunity in continuing to build upon the foundation we’ve established here at Berkeley Lab. We’re excited to begin that process over the next year with the support of the California Energy Commission and our industry partners.